I’ve had a busy, busy day…which isn’t a bad thing. I told my kiddos when we got home from being out and about “that mommy needed to do a few things on the computer (Pinterest visit).” They didn’t seem to mind, they immediately started destroying my house. Oh well. So, on to Pinterest I went. Now, don’t think I have forgotten about the black and white striped bench that the majority of you all want me to re-create. It will be done, in this fabric, and I can’t wait. The print above is the one that caught my eye on Pinterest. 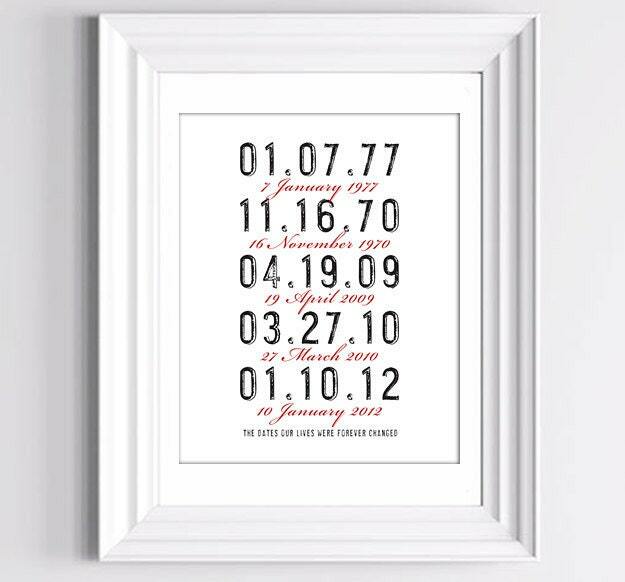 I would have never thought of doing something with the dates that mean so much to me. Have you ever thought of it? Love it! If you want one too you HAVE to visit the Etsy shop of The Memory Gallery.